GOLDA MEIR. 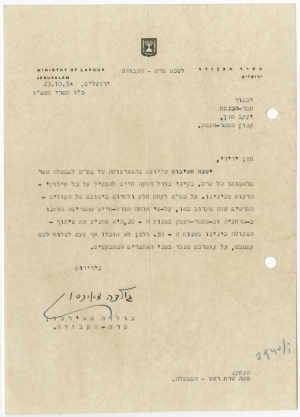 Typed Letter Signed “Golda Meyerson” as Minister of Labour, to Yaakov Hazan. Jerusalem, October 23, 1954. 1 p., 6 x 8 in. In Hebrew on Ministry of Labour letterhead.